Can I load a photo? I'm about to try loading from my new computer. Let's see...Well, it seems to have worked, although it took me a while to find and pinpoint the photo. This is Susannah, the mother of John and Charles Wesley, who helped me by modelling some hats, scarves and wrist warmers some months ago, along with Wesley, short for John. She had eleven children and was a remarkable woman in the seventeenth century in England, running a church as well as her home with no labour saving devices and few servants, and preaching when her husband was in prison or away . Her preaching was more popular than his and she drew a much larger congregation than he did, much to his chagrin. 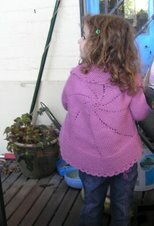 This is a shrug for my youngest granddaughter as part of her Christmas present. It's made from Heirloom Breeze from Ozeyarn I bought it from Juliana a couple of years ago and didn't make it up then. The shrug pattern comes from here (PDF file), and was well set out and easy to follow. It's really just three rectangles of basically a feather and fan pattern. The only messy bit which i am sorry I tried, although i can see why it was written like that, was to work both sleeves at once from both ends of the yarn. I stopped and did them one at a time, guessing on how long to make them so I would have enough yarn. I was getting in such a mess and tangle that I couldn't stand it. I have three balls of the Breeze left and will use them for a shrug for her sister, aged 4. They are different colours, a softblue/mauve and two shades of her beloved pink. That's her up on right side bar, wearing her Elann pinwheel jacket. She's a very slight little girl, although her sister is sturdy, so I will just make it a bit longer in the back and sleeves before the ruffle and do some stripes. I enjoyed using the Breeze. It's soft and knits easily. I split it a couple of times, but that's all. It feels soft and the stretch from the Lycra in it will mean that the one pattern fits both girls. There's a large amount of cotton in it, a small amount of wool and a bit of lycra. Having used it once, I might get some more. I like it. The shrug didn't take me long. 24 hours from start to finish, although I certainly wasn't knitting all that time! Talk about a mess! First my net access goes for WEEKS. Then computer slowed to a nasty crawl and I now have a new one. Then access was patchy and very limited. Then Google decided to turn nasty and lock me out of my mail which I had looked at only 30 minutes previously, and also out of this blog. It has taken 90 minutes of fussing and emails etc, but hopefully it's sorted no and I have a note of everything new. Sometimes you just can't beat good old paper and pen. LOL Talk about an unfriendly help process. Unhelpful too. 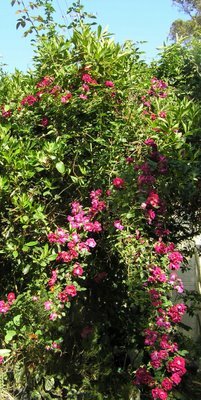 Now in a new post, I'm about to try loading a photo from tis new computer which i am slowly adjusting to after using PCs since the mid 70s. Hopefully I won't have to revert to Flickr as it's much quicker from computer. My net access has been down for at least a week. I'm using my husband's computer ina very crowded workspace with a really disgusting keyboard. I don't know when he cleaned it last,it's really grotty and I don't like using it at all. The touch is awful and it goes clackety clack. Not conducive to use. I've been knitting. Another two pairs of socks finished, yeah two fewer UFOs! I'm working on a baby jumper, knit sideways. Somehow I've strained my right index finger, so have done no knitting for a couple of days. Swelling is going now, so perhaps tomorrow. It's supposd to get to 35° here in the city, so I won't be going out to post my TimTams to the winners of my contest. They would melt before they even left the PO here. However, they have been bought and will be on their way soon. I've finished the Wildfoote socks shown below and have also finished the first Westport Wave sock, also below in honey yellow. I'm baby sitting grandchildren most of tomorrow. I'd like to think I will get a fair bit of the second of that pair done. However, past experience has shown that I often do little or no knitting out there till they get to bed. By that time I'm usually past knitting myself! I bought this book, from Tapestry Craft through the week. (It says Issue 6 when link ids clicked, but book is Moda 7.) I've made the little green jumper on the top line for a pregnant friend. She's been a long time getting pregnant and I really wanted to give her something on the announcement and probably something else later too. All in garter stitch and done in 8 ply Heirloom, it knitted up quickly. Some booties to match from the same book. I'm also doing the bone jumper on the top line in size 1 for another little person I know. It's knitted sideways in a rib. This is done in an 8 ply Cleckheaton crepe. A perfect day for being on the water today. This picture was taken from a hydrofoil going back to Sydney down the Parramatta River which was posted last week. No storm this week and none of the gale from the Antarctic which we've had several days this week. Saturday was a beautiful day here. The temperature was warmish, it went to about 31°. Yesterday was much the same and today the morning will be similar, although there is a change on the way. Today's sky has lots of heavy clouds coming up from the south and a southerly change is forecast for the afternoon. The picture was taken at the edge of the Parramatta River at Abbotsford, about 10 minutes by car from my house. From this time till early autumn we have lots of picnics along the river. There are many beautiful spots on both sides from here to Gladesville Bridge. 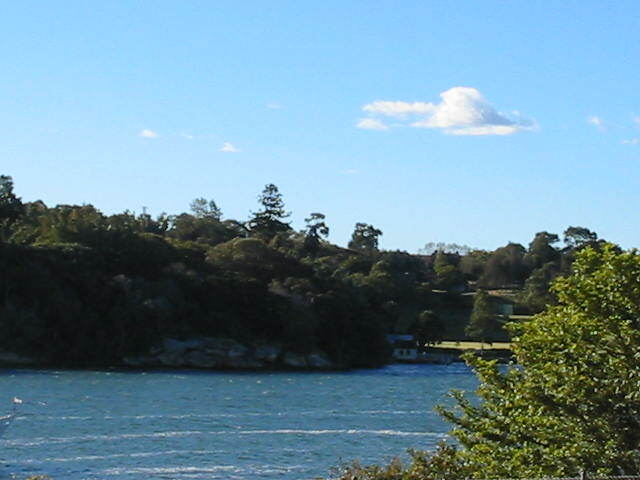 This look across to just below the old Gladesville Mental Hospital. The point is called Bedlam Point. In the nineteenth century, patients for the hospital were taken by boat to here and transferred mid-river to a row boat to take them to hospital. 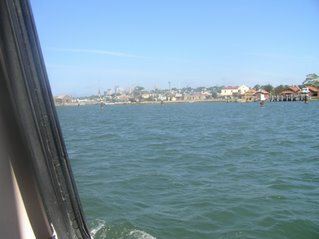 The wake comes from the hydrofoil which had just passed on its way to Parramatta. As you can see, it was low tide and there is a very small, sandy beach over the river. I wouldn't swim here. The river is still salt for a long way upstream and there are often shark sightings. Not far from here a canoeist some years ago spent a frightening time on a buoy. He had climbed onto it after a shark threatened his canoe. He was eventually rescued. Knitting? 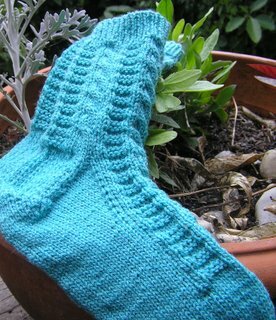 I've finished the first Westport Waves sock, pictured below. I've also done the first sleeve in a simple, plain jumper for friends who are expecting their first child next year in autumn. This baby is long awaited and much wanted. Pictures later when I get more done. If you live overseas, not in Australia or NZ, don't forget to leave a comment in the post below called TIMTAMS. Contest closes next Sunday afternoon at 4:00pm Australian summer time. Prize will be some TimTams! Enter as often as you wish. Later: It didn't even make it to the afternoon to storm. About 90 minutes after I wrote above about a storm, I glanced out out of the window. Raced out to the clothesline and grabbed things. Just as I came inside there was a loud clap of thunder and down it came. Fortunately I'd had two loads of washing done quite early. Most of it was dry and this was just before 11:00am. The damp towels and a couple of thicker tops of mine are airing in the dryer. It's still warm, the southerly hasn't arrived yet, but is obviously on its way. Leave a comment on this post before next Sunday afternoon, 4:00pm. I'll get my husband to pick a number between 1 and total number of comments and the owner of that comment will be sent several packets of TimTams . Contest is not open to residents of Australia or New Zealand because we can buy our own. I always like to have some socks on the needles, even if I have other things on the go too. They are easy to pick up and grab as I go out the door and are not very big to carry. 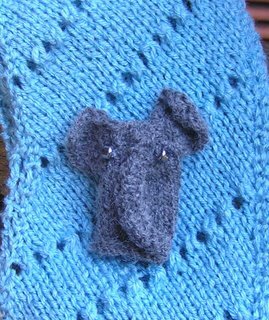 I've had some lovely conversations in the train with people who spoke to me about knitting socks, including one with a quite elderly German lady who cried when she realised that people still knit socks today. She made them for her sons who were now well into their fifties. She had told them she would no longer knit them, but she thought she might reconsider after seeing mine and realising how much she missed doing socks. These are Betty's socks - Westport Waves. 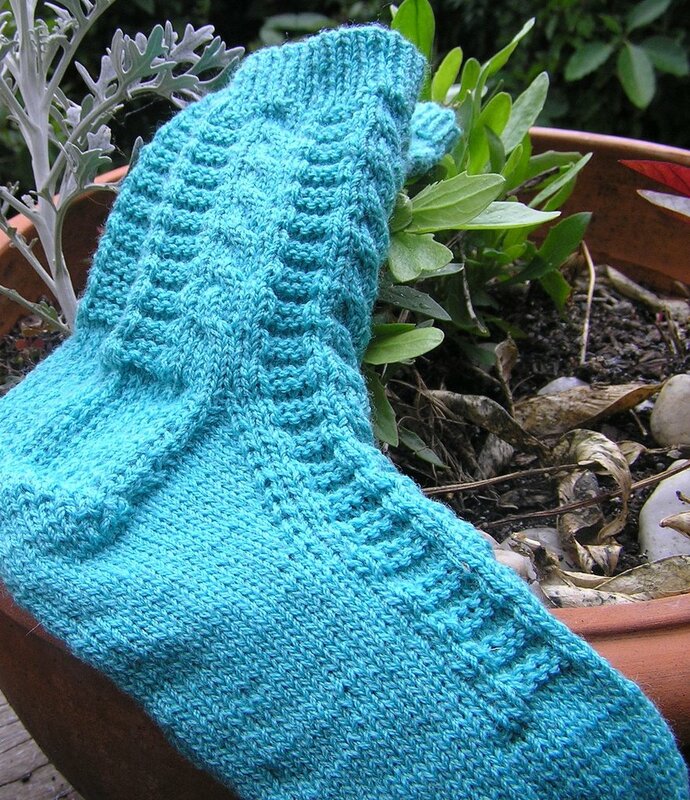 They are one of Jeane Townsend's many beautiful designs which are in the Townsend Sock Knitalong. You need to be a member to access the patterns and the group can be found on the Yahoo group page. She has heaps of lovely patterns, all well written. I've made quite a few of them. 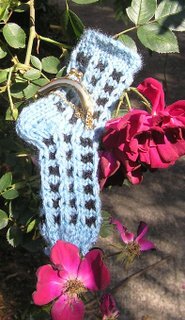 There are now also patterns by other members and they look good too, although I haven't yet made any. The group is a lovely one, very chatty and friendly with lots of international members. This pattern is super easy. There are only four rows and really only one row of pattern which is very easy. I'm using my beloved rosewood needles. The pattern puts no stress on them as a cable would do. I'm careful about using them as they were a gift and are are pretty well out of my price bracket. I think these were about $35AUS from Tapestry Craft. Here's the pair finished, although it's a bit hard to see there are actually two socks. I haven't even pressed these as I often do for a photo. I never use sock blockers but do give them a once over with the steam iron to look better in photos. The tension in the second pair is a lot tighter. I hadn't noticed till I was well down the sock. I was given some unwelcome news as I started casting on and the result shows. I've sort of hidden it in the photo. LOL. As the sock is for me and it still fits, I did nothing about it. I have had tension changes show up like this in the past, but nothing as noticeable as this is. 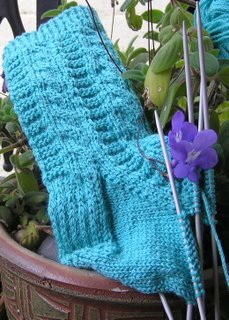 The pattern was really easy to memorise and to do and the changing of the rungs on the ladder part made the sock go quickly. I'll do this again. I'm thinking of a darker pair for #1 grandson's birthday in January. He loves hand knitted socks from me. Unfortunately he is growing quickly and his feet, while skinnier, are almost as long as mine. That probably really should mean "fortunately he is growing." There would be something wrong if he didn't grow. He turns 8 early in the new year. Here's an almost finished UFO. 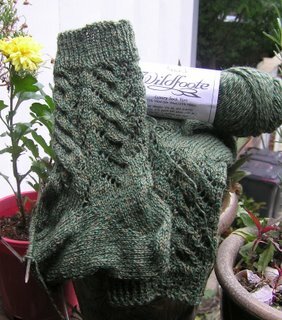 This is the Wildfoote yarn I wrote about in my old BLOGGER knitting blog. I was doing these at work in slack and idle moments, so it's taken me a while. (I work for and by myself, so knitting is OK!) I had put them up out of reach of 15 month grandson and so had forgotten about them. I'm coming down the home stretch on the foot, so there's not much to go. The Wildfoote is beautiful to feel and knit, although I am still not keen on the colour. It's an OK colour, just not what I thought it would be. I've looked at several pages of their colours and they are all different, even from those who sell the wool. Monitors show things differently to real life, but I've never seen such a difference before. It was a while ago that I started this pair and I have completely forgotten the name of the pattern. If anyone recognises it, please leave a note and I'll add it. 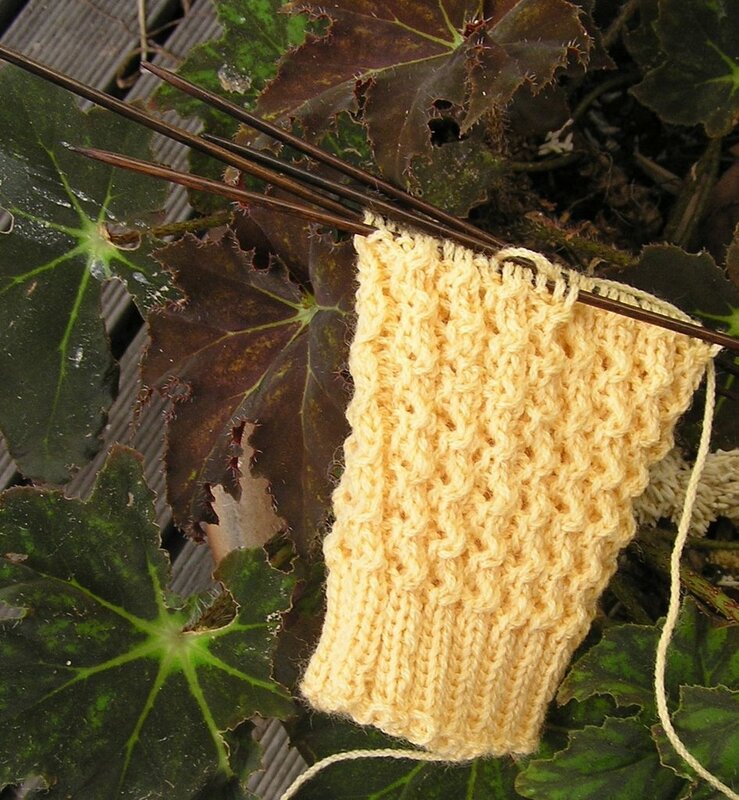 Later: It's possible that this pattern is an adaptation of Gail Dennis's Lacy Trellis socks. I've even cleaned up the piece of paper I had it printed on. Whatever. Gail's socks are very pretty, so have a look at them too. Clicking on image will give an enlargement. This is a phone camera photo, so the jacaranda in the foreground does not show the flowers with much any clarity. We've had lovely grey skies here for a couple of days, but very little rain has fallen. All of the state is in deep drought conditions and Sydney's total water storage has officially fallen to below 40%. Our main dam has been below that for many months, but now the whole of the supply is below that figure. We desperately need rain, weeks of it. Clicking on image will give you a larger photo which looks more like a painting than a photo, thanks to mobile phone and the light! Here are the 5 ply aqua socks, along with a couple of purple nodding violets. Actually no relation to violets at all, but they go by that name often. The pattern is a fourteen stitch repeat, so to make things easy for me, I've actually been using stitches on four needles and knitting with a fifth. I prefer three for the stitches, but couldn't be bothered using a marker in the middle of the instep row. I haven't done a heel flap for ages and was reminded why when I had 28 rows of it to knit and still have to watch what I am doing with gussett decreases. The cable is done every sixth row and the ladder is a two row pattern. I may get around to writing it up when finished. I'm still working on the first of a pair of socks from some Cleckheaton 5 ply crepe from the stash. Again a pretty aqua colour. I think it must be the approach of summer which chose this colour. I made a scarf last week in it, now the socks and the other day bought myself a top in a similar colour. I must remember to take a photo tomorrow when I do the Saturday sky thing. I was in the city this morning and called into the newish Border's bookshop in Pitt St. I've been to Kinokuniya's knitting section and decided to check out Borders. There weren't as many books, but some were quite different to Kinokuniya's range. If I had lots of spare cash, I could easily have got rid of quite a bit of it this morning. 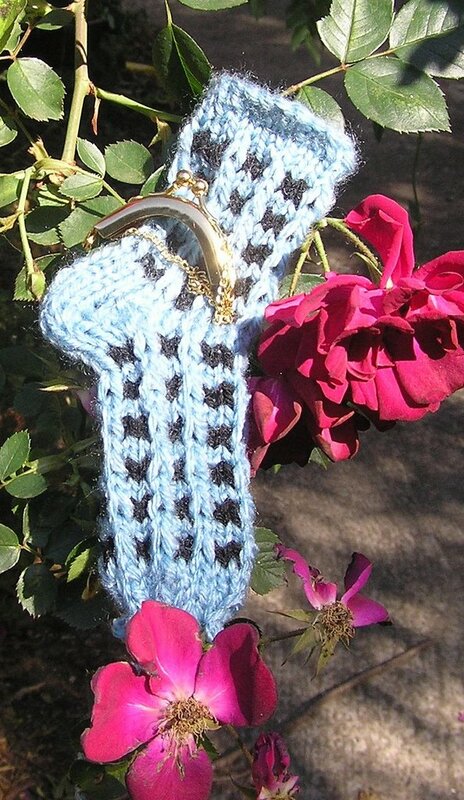 I've really been wanting to see Charlene Scurch's Sensational Knitted Socks. There it was, on the shelf! I extricated the book from the packed shelf and found a seat. Hmmm. I wasn't impressed with the quality of the binding. It looked to me as if the spine could easily break. It didn't want to open flat and I wasn't going to force it and break it. Spiral binding would have been good and spiral binding contained within a harder cover would have been even better. The book was brightly laid out and seemed to have lots of explanatory type notes. Perhaps a bit too chatty, but that's just my opinion. There were lots of patterns and I recognised some of them from stitch dictionaries. Now I'm not complaining about that. After all, knitting is only about combining plain and purl stitches and most patterns around could be reverse engineered or found in books. The skill is in fitting the stitch pattern to the garment(sock) pattern so that both the sock and the stitch are displayed to advantage. Then the pattern needs to be written up clearly. I had just about convinced myself to buy the book when I turned it over and checked the price. I should have done that in the first instance. Basically AUS$54.00. Perhaps if I get some Christmas money, I might think about it. The book is available from Amazon for US$16.95, originally US$24.95. Even adding 25% to the dearer price and allowing for postage, I doubt it would come to $54. Update later that night: I have actually ordered this from Amazon. Using the cheapest postage, the total was marginally over AUS$37 - somewhat cheaper than Borders? I don't need it immediately, so what is a couple of weeks, even a month in having it get here? The exchange rate was US$1=AUS 0.76. I should have done this yesterday. The rate was up another 1.5 cents! I started another pair of socks last night. Machine washable 5 ply in a pretty, deep aqua colour. I decided to treat myself and my fingers which have been aching a bit lately, so took out my rosewood 2.75mm dpns. They are lovely to use and I really enjoy them. 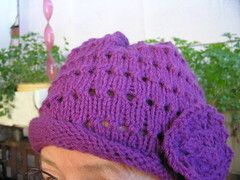 However, the pattern I chose has a ribbed ladder alternating with cables. Cables and rosewood? Not a good mix. I did every cable holding my breath in case they snapped. Now that is one way to really slow down the knitting. Not only that but the 5 ply on that size needle made a very stiff fabric which was not fun to knit at all. This morning I decided to be sensible about the rosewoods and got out some steel needles. It was that or my beautiful caseins which would have the same problem as the rosewoods. SNAP! Then I remembered the stiff fabric and decided I needed to go up a size. I could find only two 3mm needles. I have no idea what happened to the rest of the set. It's not a size a use very much at all. Because the pattern is 14 stitches, I decided to use five dpns, although I much prefer four. So I have 3 smaller needles and two larger. I thought I would just give it a go and see what it looked like for a couple of cables, knowing I could always frog it. It doesn't look too bad, much to my surprise. I have no worry abot snapping needles and the fabric is much more pliant but still fairly close knit. There is a slight mark where I changed needles, but there won't be on the second sock. If anyone is looing so closely at my ankles as to see the difference, then good luck to them. I'm thinking that perhaps even this may disappear somewhat in the wash. I'm getting used to the five needles. I've done it before and it certainly makes the pattern easy to see but I prefer the rigidity of the triangle formed by three needles and knitting with the fourth. Another present for Christmas, somewhat of an experiment. This, I hope, will become a small change purse for Miss Six. It's actually the same colour blue as the scarf below, just taken in a different light. The curved thing you can see is the purse frame and I'm not sure how well I will be able to put the two together. We'll see. The pattern is a mosaic slip stitch which makes a very firm fabric.Two rows of the blue, then change colour. Knit 2 with new colour, slip 1. Two rows like this, then repeat the four rows. Easy and effective. It took some experimenting to find what I think is the right number of stitches for the frame. This was done on 3.25 mm needles with 21 stitches. I'm making a set of finger puppets for one of the grandchildren at Christmas. This is the first I did. he yarn is some leftover Caressa and the beads used for eyes were leftovers from the Caressa Odessa hat I made for a daughter in law. His trunk seems to have a kink in it. He needs a bit of blocking, but if the kink stays, I'm not really bothered by it. 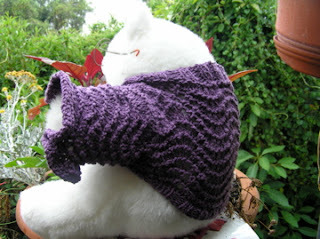 The pattern is in the 2007 Knitting Pattern a day Calendar. I usually have trouble finding this calendar but was walking along a city street a week ago and passed Borders. There they were in the window, so I bought one. Not only have I now bought it, but I've been through and made a note of the thingsI want to make. There are lots of things I would never consider, things I have no one to give to and so on. However, I still like the concept. MIL is now in the nursing sectionof the home after the seventh hip dislocation and the third hip replacement. She won't do the physiotherapy and so can not look after herself. She hates getting out of bed and has now lost the hostel room she had. We had to clean it out for a new occupant. She had a whole heap of costume jewllery, most of it junk Strange really for someone whose brother was a wholesale jeweller with access to good stones and manufacturers. I have sorted it and kept the good stuff. I've given the DILs and grandaughters some keepsakes. There was a pile of broken junk and I was going to toss it. However, perhaps I'll have another rethink abut this. I could use some of the beads. I've done a few scarves but not photographed them. Several have been given away as posted hugs for those in need. This is done in Patons Zhivago and the colour here is reasonable. Perhaps there is a bit more aqua in real life. The scarf looks as if it was done on the diagonal. Very easy. Every second row, increase one stitch at beginning of row, and knit the last two stitches of that row together. The eyelet rows are done on every ninth row and actually go straight across, although the increase/decrease makes them seem on a slope. I had trouble taking the photograph. It was very windy outside and every place I tried to pose the scarf saw it blowing to the ground. It still twisted on the end, a combination of being still unblocked and the wind. Those rolls in the background? Not what you possibly think they are. Rolls of some offcut floor vinyl, kept by my husband "as they might come in useful." 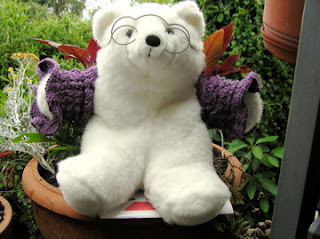 I have been doing some knitting, although things were given away before phtographs were taken. Several scarves, a few pairs of socks, two pairs of slippers... However, life has been very busy and I haven't done much for the last couple of weeks. Canteen finishes next week, so hopefully I'll have some more time available. I thought I'd try beta blogger and see what it was like. I've never been able to upload images on the old blogger template. I've always had to work through Flickr, so if this works, then that's a step saved. All my old posts are still available at at the old blog. This is a rose which started out in a pot. I think the pot is still there but the rose now has roots in the ground. 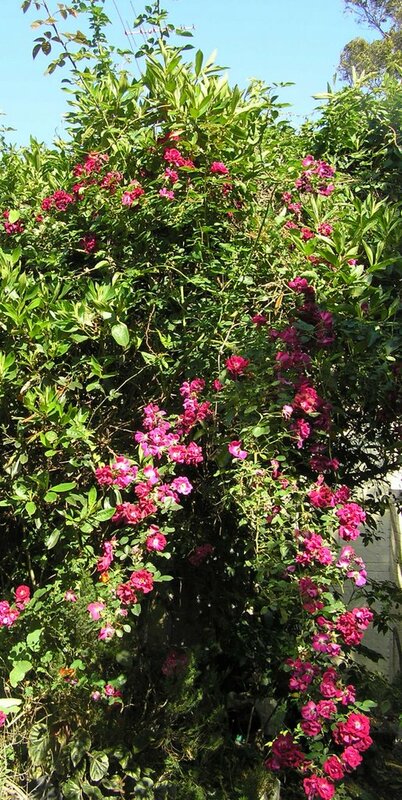 The hot, dry weather we have had this spring has produced beautiful displays of roses around Sydney. Unfortunately it hasn't done much good for the rest of the garden and certainly not much good for crops and farms. Yes, there is some sky. 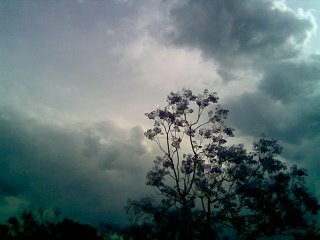 This picture was taken quite early, so the sky was washed out in colour. My husband is driving to Bourke today and left early with a friend, about 5:15 am for at least a ten hour drive. It's light very early, not long after 4:00 am, although dalyight savings kicks in tonight.